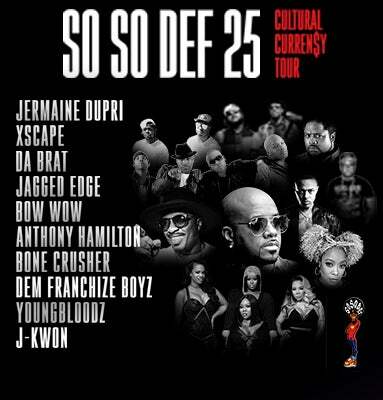 Jermaine Dupri has announced that in order to give his fans the show they deserve for the So So Def 25th Anniversary tour, he needs more time to properly produce his vision. Because of the additional time needed, the first and only confirmed date for the tour at this time is on Sunday, October 21 at State Farm Arena in Atlanta, GA.
Due to this change in the advertised tour schedule, for the time being the other remaining previously scheduled dates for the tour (including Oct. 20 at Greensboro Coliseum) have been cancelled until further notice. Ticket refunds are available at point of purchase for all cancelled markets.